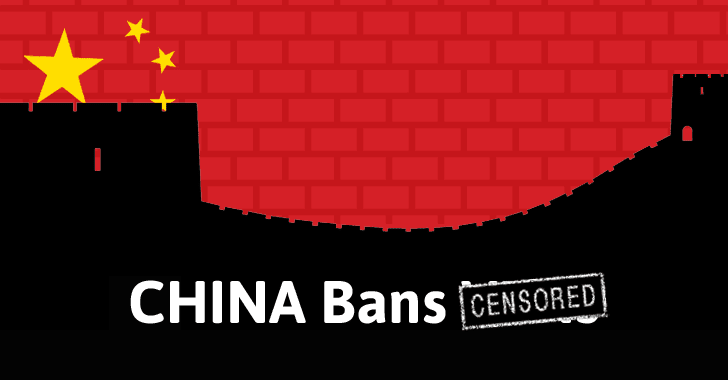 China is long known for its strict Internet censorship laws through the Great Firewall of China – China's Golden Shield project that employs a variety of tricks to censor Internet and block access to various foreign websites in the country by its government. The Great Firewall has blocked some 171 out of the world's 1,000 top websites, including Google, Facebook, Twitter, Tumblr, Dropbox, and The Pirate Bay. Therefore, to thwart these restrictions and access these sites, hundreds of millions of Chinese citizens use virtual private networks (VPNs). But now, the Chinese government has announced the mass shutdown of VPNs in the country, making it harder for internet users to bypass its Great Firewall, according to a report published by the South China Morning Post. Calling it a "clean-up" of China's Internet connections, the Ministry of Industry and Information Technology said on Sunday that it had launched a 14-month-long crackdown on the use of unsupervised internet connections, including VPNs. VPN services encrypt your Internet traffic and route that traffic through a distant connection so that web surfers in China can hide their location data and access websites that are usually restricted or censored by the country's so-called Great Firewall. The new rules make it illegal to use or operate a local VPN service without government approval, and require all VPNs and leased cable lines operating in China have a license from the government. According to the ministry, "all special cable and VPN services on the mainland needed to obtain prior government approval—a move making most VPN service providers in the country of 730 million Internet users illegal." Moreover, every internet service provider (ISP), cloud services provider and VPN reseller are also required to carry out "self-inspections" for any illegal activity taking place on their servers. In a statement, the ministry said that the country's VPN and cloud computing market "has signs of disordered development that require urgent regulation and governance" and that the crackdown is designed to "strengthen cyberspace information security management." The ban on VPNs and cable connections would begin immediately and will remain in place until March 31, 2018. Besides the VPNs ban, China's IT ministry also said the government would be investigating ISPs, content delivery networks and internet data centers for failing to receive the right business permits and operating in areas that exceed their intended scope. The move is the latest in a long series of attempts by the Chinese government to stop its citizens using VPNs and other filter-busting systems, which made them unable to have a tight grip on their people.